PANJIM: Guardian Angel Sports Club will clash with Santa Cruz Club of Cavelossim in the inaugural match of the Goa Professional League to be played at Duler Stadium, Mapusa, on Sunday, August 21, at 4 p.m.
“The home teams will benefit from the collections made during the match played at respective home ground,” he added. “GFA hasn’t cut out a deal with any sponsors but we are in talks. The sponsors might be announced sooner,” Welvin answered when asked about the sponsors. 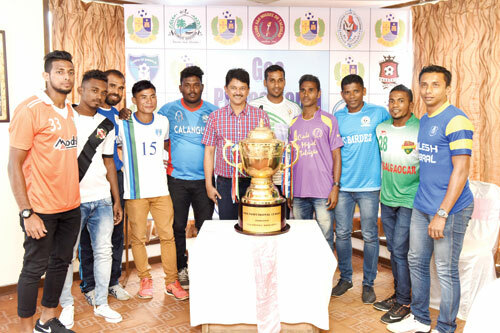 President Elvis Gomes congratulated the new entrants FC Bardez Goa on winning the Goa Police Cup and wished them success in the pro league. The Goa Professional League trophy was later unveiled at the conference. A total number of 11 teams that will feature in the Goa Pro League 2016-17 which include, Sporting Clube de Goa, Dempo Sports Club Pvt. Ltd., Salgaocar F C, Churchill Brothers Sports Club, Santa Cruz Club of Cavelossim, Calangute Association, Vasco Sports Club, Guardian Angel Sports Club, Clube Sao Miguel de Taleigao, Corps of Signal and a direct entry team Football Club de Bardez.